Chinese Premier, Li Keqiang has met with United States Secretary of State, John Kerry the past two days (pictured above). 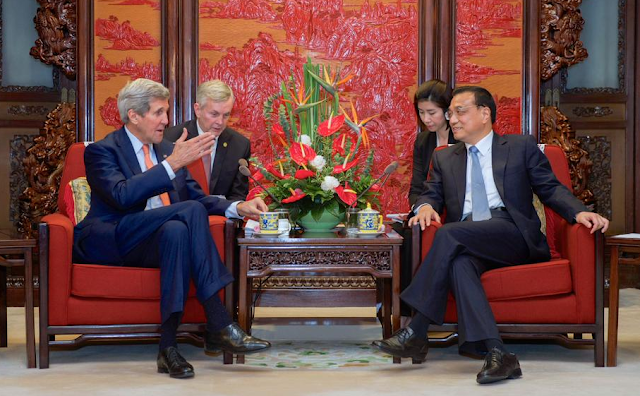 Secretary Kerry has also met with Xi Jinping - the Chinese President. And while there is certainly contention on the issue of China's territorial claims and island-building in the South China Sea, the above two diplomats enjoy a good rapport. Note they are angled in towards each other - each with their torsos rotated and their far legs crossed over their near and pointed towards each other. They both are leaning towards the other (Li Keqiang more so) - as well as leaning forward - with their backs away from the chair. Contrast this with the image below of Barack Obama and Vladimir Putin captured just outside of Moscow in July of 2009. This moment was, of course, well before the annexation of Crimea or the separatist movement in Ukraine came to a head and before the downing of the Air Malaysia Flight 17 over Ukraine - yet Putin's body language posture spoke/continues to speak volumes. His hyper-alpha "man-spreading"/seated crotch display is very much a body language expression of dominance. Moreover he's not directing his lower body toward Mr. Obama - in very deliberate non-acknowledgment of the then, newly elected American leader. 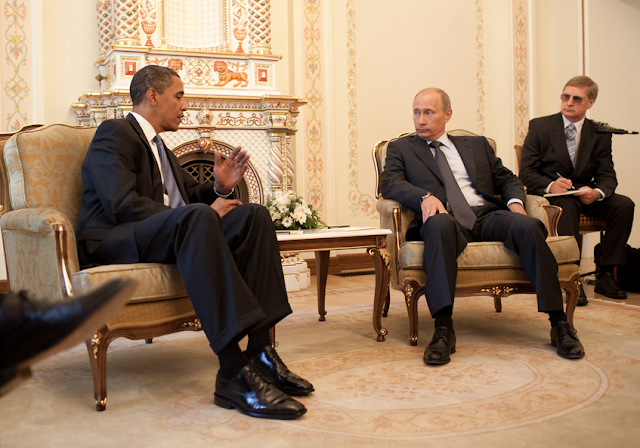 President Obama is rotated both in upper and lower body towards Mr. Putin. Obama's back is away from the chair, leaning forward. Vladimir is having none of it. He's got his back against the chair and is slouching. This is very similar to what we would expect a defiant high-school boy being reprimanded by his principle/headmaster and (internally) saying, "I'm here because I have to be, but you are beneath me." Putin's elevated central forehead contraction with a trace mouth pseudo-smile is screaming incredulity, contempt, arrogance and dismissive emotional tones. Both the Chinese and the Russians are shrewd diplomats - and certainly, one photo does not foreign policy make - yet body language does not lie. The Chinese will no doubt take a firm stand on the South China Sea and various other issues - however they want to get along. They want diplomacy. Vladimir simply doesn't care. A Reminder: This website serves as an objective reference source for the science and art of Body Language/Nonverbal Communication. In an effort to be both practical and academic, many examples from/of varied cultures, politicians, professional athletes, legal cases, public figures, etc. are cited in order to teach and illustrate both the interpretation of others' body language as well as the projection of one's own nonverbal skills in many different contexts - not to advance any political or religious agenda.